Just bear with me on this one, OK? Content is often the key element for many online business owners, that we know. And it’s not hard to see why because it’s, well … difficult (to say the least) to attract any traffic if you don’t have anything interesting on your site … perhaps even impossible. This makes writing (as an activity) an essential part of every online entrepreneur’s existence. For quite some time now I’ve been mentioning one specific writing/blogging advice I got from somewhere, can’t remember where, unfortunately. Anyway, the advice is to write two separate drafts of one post. Here’s how it works. 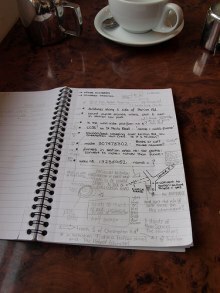 You write the first draft, from top to bottom, and then immediately afterwards you start over – you write the second draft without looking at the first one. You simply try to come up with the complete post for the second time. And it’s not about reproducing the initial draft. It’s about writing the second one in whatever way you find suitable. You can write it by following the same thought process and reaching the same conclusions, but you don’t have to. If a new and interesting idea strikes your mind then by all means put it on the screen. First of all, it’s not two times the work. More like a 1.5 times the work. Chances are that you’ll get the second draft done much quicker than the first one. You already have the mindset, the information, and a precise plan in your head as for what path you want to take with the post. This will likely make you write faster. By using this technique you simply end up with this mysterious “quality content” that’s so important for every blogger and online business owner. I’m not implying that without using it you can’t end up with equally good piece, but from my experience, it’s a lot harder to write something you’re truly satisfied with at the first attempt. Of course, this technique takes time, and it seems counterproductive. You may be thinking that the time is better spent on writing something completely different. But consider just this one thing: would you rather write one truly valuable and enticing article, or two that are good but not quite at the “great content” level? I’m going to leave you with this question to answer on your own. One more thing. Maybe you have some pieces of “strange” writing advice that are similar to this one? Feel free to share your thoughts in the comments.